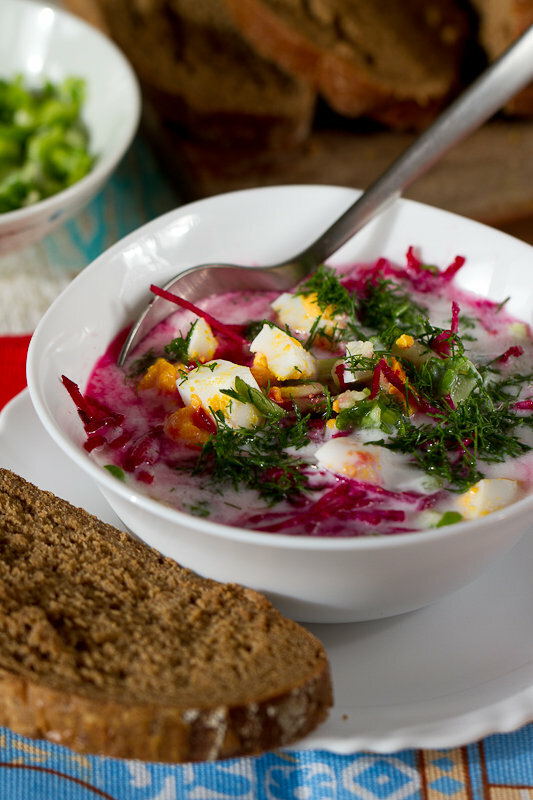 Sveckolnik [sve’koljnik] – Russian summer cold soup, which goes really well during the summer heat. 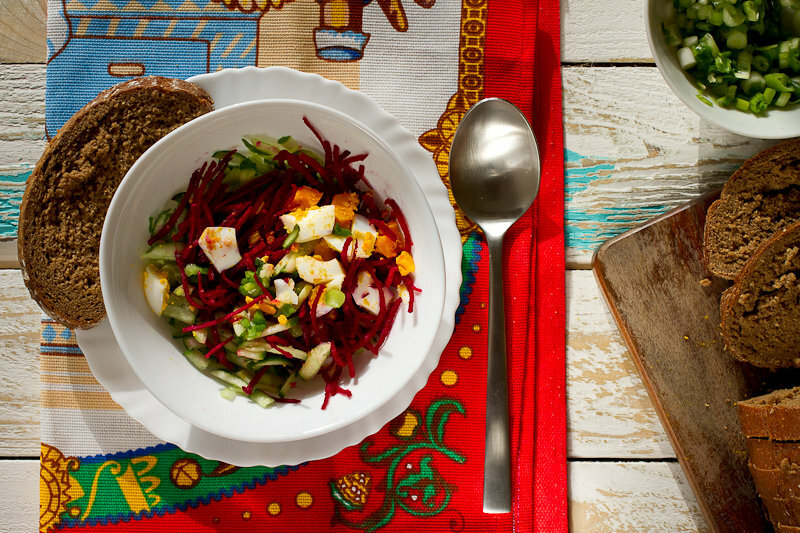 The name comes from the word “sveckla”, which denotes beetroot. When AC and even hundreds of ice cream don’t help you against hot, this light soup refreshes and cools you. The main ingredient is a raw beetroot, it’s high in vitamins, minerals and fiber that can effect the digestive system in a positive ways. Raw beets are one of the top vegetables for nutritious raw eating, according to Bastyr University. You can include this light soup in your balanced diet and it takes only few minutes to prepare it. Better to choose small young beets. And you can substitute raw beets with boiled, if you like. Shred beets and cucumbers, put them in a deep plate. 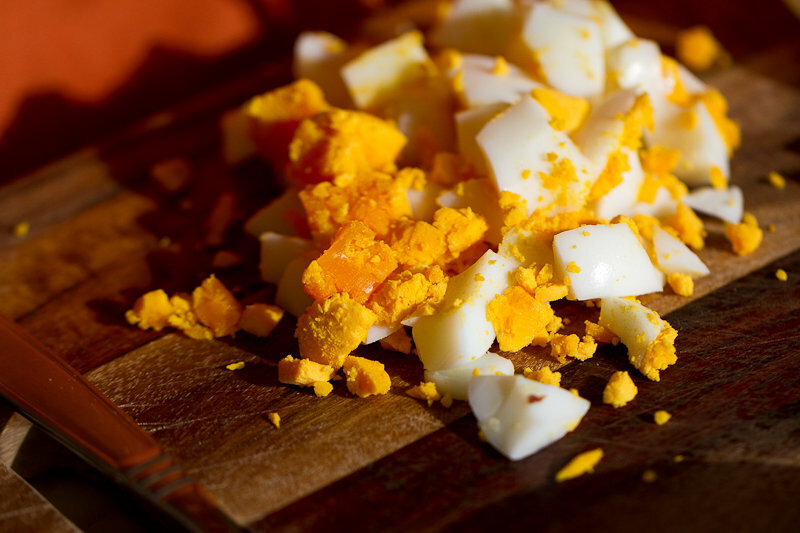 Boil eggs for 10 minutes, let cool and cut them into chunks. 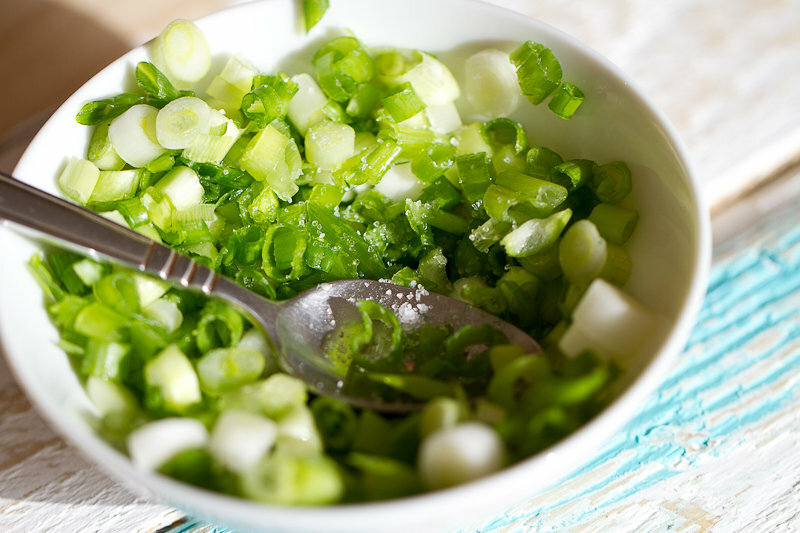 Slice green onions, put it in a cup and add some salt. 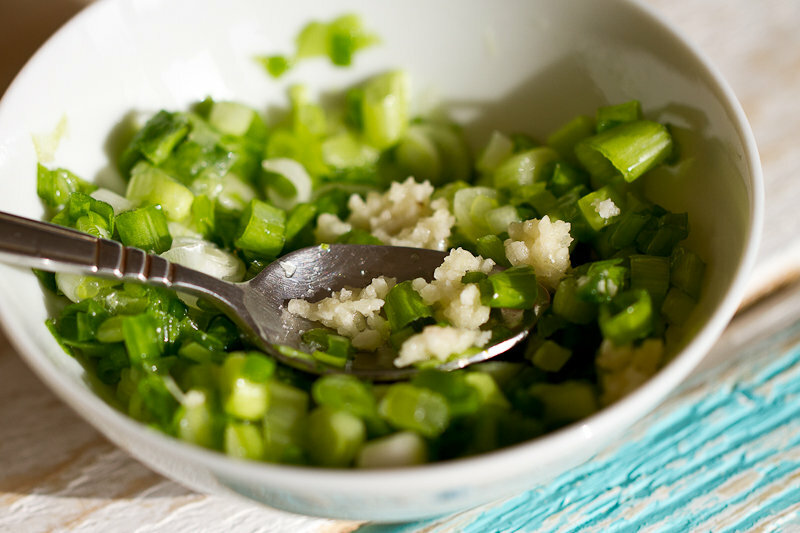 With teaspoon begin to grind the salt into onions. Add crushed garlic and mix. 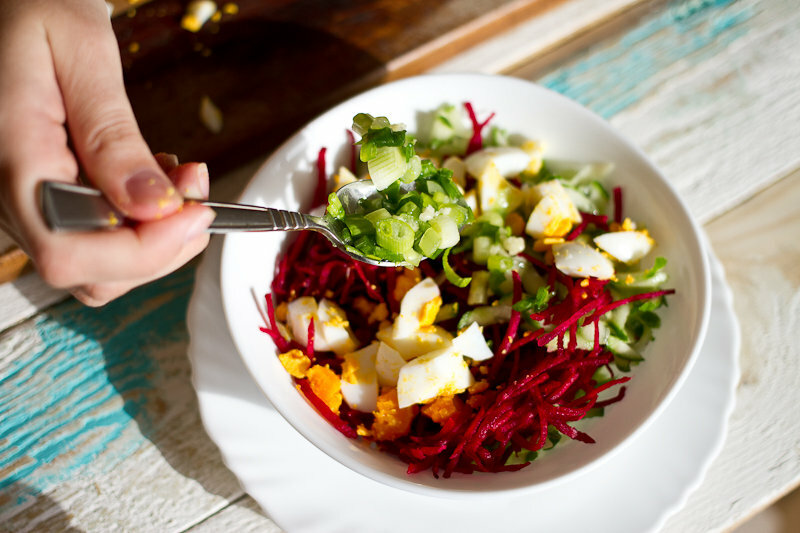 Combine together beets, cucumbers, eggs, onions and dill. Add a pinch of sugar. For the liquid part buttermilk is mixed with cold drinking water, the volume and thickness of it totally depends on your taste. If you can find “salted lassi” (yougurt drink)-use it, no need to dilute with water; in Arabian countries it’s called “laban up”, in Russia – “tan”, “sivorotka” . Pour the buttermilk over dry ingredients and mix well. Sprinkle some dill. You can serve it with a dollop of sour cream and rye bread. Aug11August 11, 2013 • By milkandbun • This entry was posted in Healthy choice, Russian cuisine, Soups and tagged beet, cooking, dinner, DIY, eggs, food, food photo, healthy, healthy eating, light, lunch, photography, photos, raw vegetables, recipes, ricipe, Russian, Russian recipe, soup, summer, vegetarian, veggies. Bookmark the permalink. I am so glad to see you post your sveckolnik! This looks so lovely I am going to try your recipe this week. I can almost smell it just by looking at your photographs. Gorgeous soup. Thanks:) and let me know how it’ll turn out.